Type: The BMW i3 is available as a fully battery-electric vehicle, but adding the range-extending gasoline engine (as my car has) makes it a plug-in hybrid. The REx is a unique hybrid in that a very small gasoline engine generates backup power for the battery but is not directly linked to the drivetrain. Time owned: 0.5 years of ownership; but before this, we leased a 2015 model for 2.5 years. So almost 3 years of experience. *When new, at time of model release. What made you decide to go electric and how did you decide what car to get? I saw all the negative external costs of using oil, such as pollution and conflict, and wanted to reduce that. At first I was interested in Audi’s A3 e-tron, but I changed my mind after reading an online review comparing the e-tron with the BMW i3. We also considered other plug-in hybrids such as Ford C-Max and Honda Accord, but BMW was the only dealership that seemed interested in promoting their EVs over their gas-powered vehicles, and the i3 has a very nice interior compared to other EVs. And our lease started on the last day of 2015, so we were offered a pretty good deal. How has the cost of purchasing and owning your EV compared to the cost of purchasing and owning a conventional car? Lease returns on i3s are amazing deals for a car of this quality. I bought mine used from Select Motors in San Mateo. They regularly have available 10 to 20 i3 REx cars loaded with options (upgraded interior, rear camera, adaptive cruise control, and parking assist), starting at $18,000. Charging the car at home is low cost, especially when combined with solar net-metering. I’m looking forward to the future, when electric utilities might offer financial incentives for EV owners to limit charging at peak hours to flatten the demand curve and/or for EV owners to connect their vehicles and send energy back to the grid when costs are high and to avoid brownouts. 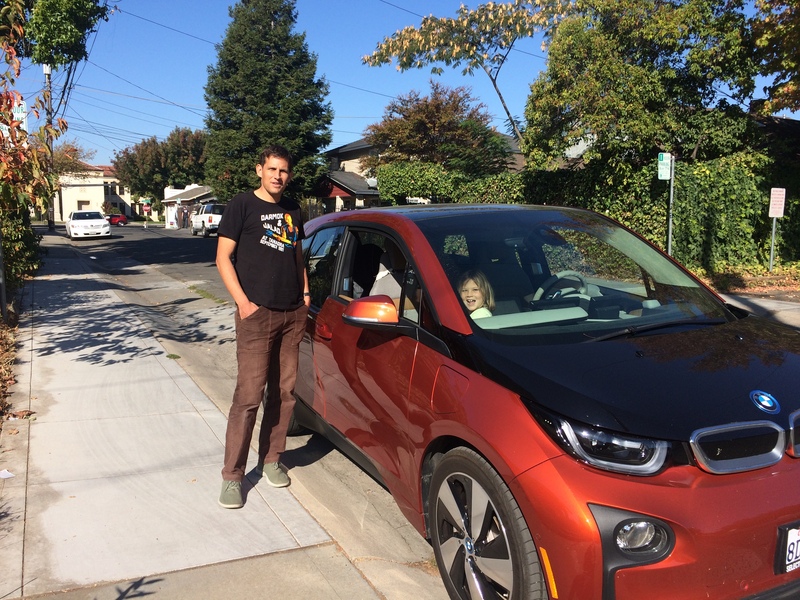 Finally, our i3 has been very low maintenance so far. EVs have fewer internal components than gas-powered vehicles, so maintenance usually doesn’t involve much beyond changing tires when they wear out. What have been the biggest challenges of going electric? Range anxiety, but the range extender really alleviates that. Many i3 owners rarely use the range extender, but appreciate it being there as a convenience. Also, we were concerned that the battery wouldn’t last long, which is why we leased our first one. But after leasing for a while we became comfortable enough to transition to ownership. What are the biggest misconceptions of going electric? The few cases when EV batteries have caught fire have been way overblown in the media. EVs are just as safe as gas-powered vehicles, if not more so. Also, it’s very easy to charge overnight at home. For a couple years, we were just using a regular 120-volt outlet for Level-1 charging. About a month ago, I added a 240-volt outlet to an existing 30-amp circuit for faster Level-2 charging. Describe one of the farthest/coolest/most ambitious trips you’ve ever taken in your EV. We visited the hostel at Point Montara Lighthouse, between Pacifica and Half Moon Bay. Do you have any good stories about your experience as an EV owner? EVs and rooftop solar go well together. Since we had been charging our car for a few years, our energy use was up. Because of our increased energy use, our electric utility approved us to install a larger photovoltaic (PV) system at our house than we would have gotten otherwise. We’ve been able to use our PV to support our EV! What is the number-one thing you think could be done to encourage more people to go hybrid/electric? Going electric is a lot easier when you realize you don’t have to figure it all out by yourself. There are plenty of online forums where you can find out more about other people’s experiences—both with EVs in general and with specific EV models—as well as ask questions of your own. The Fully Charged YouTube channel is also a helpful resource to learn more about different types of EVs.